Polygamy and polyandry were prevalent In ancient India, but it is doubtful whether they were ever popular in the public opinion. It was practiced mostly by the warrior castes, rich merchants, and feudal lords. Polygamy in ancient India was a matter of personal choice, a status symbol and at times a social, moral and religious obligation. Marriage in Hinduism was traditionally and historically meant for progeny and carrying out obligatory duties (dharmakaryam) in accordance with a person's dharma (duty) so that the four major aims (purusharthas) of human life could be realized. If polygamy served such ideals, the Hindu law books did not object to its practice. The Hindu law books (dharmashastras) made provision for polygamy, and certain marriage relationships under special circumstances, not for the purpose of carnal pleasures, but for procreation and continuation of family lineage. According to them, a woman had no independence of her own. She always needed the protection of her closest relations so that she would not seduce men and bring disrepute to herself and her family. Therefore, it was the duty of her husband and the male members of his family to keep a close watch on her and never leave her in the company of other males. If her husband died, leaving her childless and without care and protection, she had the permission to marry his brother, strictly for the purpose of begetting children and find a shelter1. A woman whose husband left her for a foreign country or disappeared for a particular period of time, unless he took sanyasa (renunciation), had the permission to remarray according to her free will2. There are four castes (varna, viz.) Brâhmanas, Kshatriyas, Vaisyas, and Sûdras. Males belonging to them may take wives according to the order of the castes, viz. a Brâhmana four, a Kshatriya three, a Vaisya two and a Sûdra one. Sons begotten on wives of equal or of the next lower castes are called Savarnas of equal caste. Those born of(wives of the second or third lower castes become Ambashthas, Ugras, and Nishâdas. Of females wedded in the inverse order of the castes are born Âyogavas, Mâgadhas, Vainas, Kshattris, Pulkasas, Kukkutakas, Vaidehakas, and Chandâlas. Many Hindu gods are also depicted as polygamous, with two or more wives. The goddesses are not actually wives in the physical sense but pure universal energies who assist their gods to maintain dharma (good order) in the universe. They do not possess physical bodies, though they can appear in human form if they want to. If we study the history of ancient India, we realize that polygamy and polyandry were practiced by the rich and the powerful, while the sages and seers were strictly monogamous or completely celibate. We also notice that whether it was in the past or in the present, polygamy was never a popular practice in the public opinion. Yet in the epics and the Puranas we cannot fail to notice the prevalence of the practice and the tensions and the obstacles it created in the families and in the performance of obligatory duties. Lord Rama, an incarnation of Vishnu, was strictly monogamous, a practice that was probably in accordance with the moral standards of Treta yuga (the second great epoch) in which he incarnated. In contrast, Lord Krishna, another incarnation of Vishnu, who incarnated in the following Dwapara yuga, was polygamous. 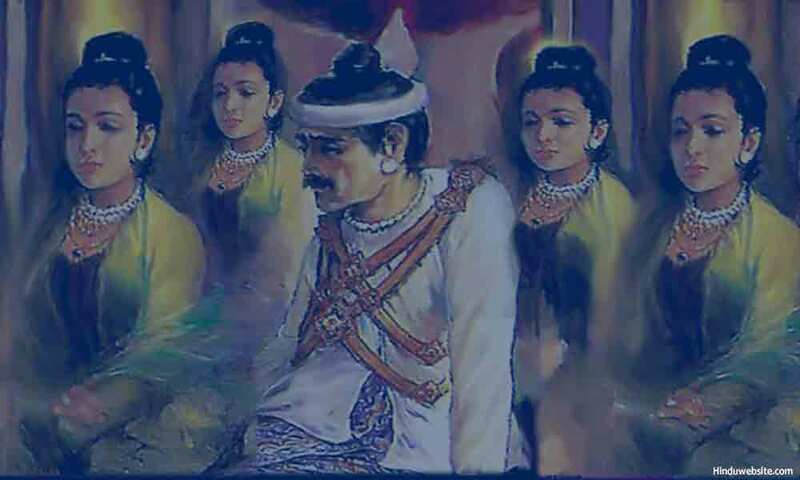 The Pandavas, to whom he was related through his sister, practiced both polyandry and polygamy. It was a sign of the declining moral standards and growing decadence of society, as a part of the progression of human society, in which the Eternal Dharma was meant to decline gradually from order to disorder, from monogamy to polygamy to mixed marriages to, finally, sham marriage or no marriage. Hindu scriptures describe family as a social institution, and at the same time as an integral part of this illusory world. In the ultimate sense the institution of family is meant to keep each individual chained to the world of illusion. The relationships in the family are meant to develop attachment, selfishness and desires. In the end these relationships really do not last, just as everything here is impermanent and each individual is left to himself or herself to take care of liberation. When it comes to the pursuit of the three chief aims of human life (purusharthas), namley dharma (religion), artha (wealth) and kama (sensual pleasure), we may take advantage of conjugal relationships, but in case of the fourth aim, moksha (liberation), we have to take sole responsibility for its attainment, by withdrawing ourselves from all relationships, attachments and allurements. From a spiritual perspective, Hinduism therefore rightly views family as an illusion (samsara maya) and the main cause of our attachments. A family is a coming together of different souls, each having his or her own distinct spiritual agenda and final destiny, joined together by some predominant goals or purposes and bound by the karma of their previous lives. Some relationships may last over several lives, while some are meant for a short duration. Hidden in each relationship are some important lessons, messages and learning opportunities, by knowing which we make progress in our lives. On the evolutionary path, each soul has to work out its own salvation by its self-effort. Others may facilitate or obstruct the process, according to the choices we make. What appears to be other peoples' involvement or interference in one's life is, in reality, nothing to do with oneself but with themselves. Family relationships are, in a way, a great distraction, because they develop attachment and delay the liberation of the of the soul. What is true and what makes life meaningful is our relationship with God, because in the real sense the hidden self is nothing but God only. Hinduism therefore exhorts every individual to be wary of the illusory nature of the family and develop a divine oriented attitude, while performing their obligatory duties as a sacrifice to God. Since family itself is an instrument of maya, polygamy makes it even more difficult for a householder who becomes entangled in it due to desires to break out of his illusions and achieve liberation. The extent of karmic burden which arises from multiple conjugal relationships is huge since one forms many relationships through multiple marriages with many women, whereby many lives become associated with him in his role as a husband, father and grandfather. As a result, his karma becomes entwined not only with his wives but also with all the children who are born through them and their descendants too. Whatever he does or does not do will affect the lives of all the women he marries and those of their children. Therefore, spiritually polygamy is the least desirable option for a householder to pursue. Present day Hindus do not practice polygamy. Many educated Hindus, consider both polygamy and polyandry primitive and immoral, and remnants of an ancient world that has little resemblance to the world in which we live today. It is not that it is entirely absent, but those who practice it are subject to social, economic, legal, and family pressures. Many keep the second marriage a secret, knowing the consequences. Some convert to Islam officially to escape the law of the land. In India, the Hindu Marriage Act 1955, declares polygamy as both illegal and punishable under the law. One of the conditions stipulated by the Act is that a marriage may be solemnized between any two Hindus, only if neither party has a spouse living at the time of the marriage. The Act also makes provision for seeking divorce on the grounds of adultery or if either party had married again without divorce or were already married and were not legally divorced. The Act explicitly declares bigamy a punishable offence under Indian Penal Code. A Hindu man can still a marry a second wife, with the explicit permission of his first wife, or on certain grounds, such as insanity.